Hello!!! You are Probably Here because a Blue Screen of Death (BSOD) Popped up out of nowhere on your screen. And you were asked to search online for the Error "Critical_Process_Died" or "Critical Process Died Windows 10". Windows 8 and Windows 10 Users both are facing this error more frequently than not. BSOD are a nightmare for Windows Users because once it happens it won't allow you to do anything. Your Computer might restart on its own after collecting error information, but again the blue screen appears with the same error which in this case is Critical Process Died. The Cycle Continues until you find a Fix to it and get back to normal. Blue screen of death like this may scare you at first, but it gets easier once you know how to fix them, Which you will indeed know today here. Let us start with our mission to work around and Fix Critical Process Died in Windows 8 or Windows 10 Error. From the name of the error, one can make out that One of the many Processes required for the Windows to Run have ended and thus the Blue screen.There are plenty of reasons for this BSOD;We will list few of them below. Another Reason can be Malwares/Viruses on your system, Conflicts can result in Blue screen. So now you can be very sure that any of the above Culprit is responsible for Critical Process Died error on your Windows 8 or 10 PC. Now that we know the reasons, We will directly jump in and see how we can solve this Problem on our own. Method #1: Correcting/Updating Device Drivers. If you are able to boot your PC without Critical Process Died Blue screen then, straight away skip to How to check faulty Drivers and update them Below. But, If you are unable to boot your PC to start screen; You may wonder, To Update Device drivers, I should be able to load windows at first place, and this BSOD won't allow me. Relax, you will first boot your PC in SAFE MODE. This will guarantee that no unwanted drivers are loaded while booting. Booting your PC in Safe Mode itself can solve the Issue if you are lucky. Restart your PC and Press Shift + f8 keys while the Motherboard is loading, Make sure you hit these keys before the Windows logo appears. If you successfully do this task, then you will see Advance Repair Option Screen (After a few unsuccessful attempts to load windows, you are automatically shown Advance Repair option). How to Check Faulty Drivers & update them. Once you are in safe mode, You need to check for any faulty Device drivers. Simply Click Windows + X and Click on Device Manager. If any drivers of your Computer hardware are faulty or Conflicting, then they should have Yellow Flag on it. All you have to do is Expand each Category one by one to search Yellow flag on any drivers. If you don't find anything, then you can be sure that Drivers are not the Culprits. But if you find any drivers with a Yellow flag or a Yellow Triangle, then Right click on it and update them if an update is available. Alternatively, you can download the drivers from manufacturer's Website too. If the drivers are up to date then Disable them and then again Enable them if that helps. If it doesn't, Uninstall those Drivers by right Clicking on it. You might be prompted with Warning message but just do it. Now Click on Action from the Menu bar and click on Scan for Hardware Changes, This will Install the drivers again and might well solve the issue too. Now reboot your PC to see if you are still getting Critical process died BSOD error. > Easiest way to fix Drivers Issue. If you wish to skip the hard work then, I have a very easy to use Method too. You can use this method if manually updating or uninstalling drivers doensn't help to fix Critical Process died BSOD. The method is to use Specialized tool to Scan and Repair Driver Issues. Use Driver Agent to Scan for All Outdated and Faulty Drivers on your System. Step 1: Click Here to Download latest Version of Driver Agent. Step 2: Install it just like any other Software. Step 3:Once Installed, Run it and it will Automatically Scan your PC for Outdated/Faulty Drivers. Step 4: Scan should not take more than a Minute, You will be shown List of Outdated Drivers. Step 5: Click on Download all and then click on Next. This Program Can not only Update your Drivers but also Backup and Restore them any time too. Regularly Using Driver Agent Ensures Fast and Error Free System. This is made Possible because you get access to Millions of Drivers database readily available for any Hardware. Method #2: Repairing Windows Registry & System files. If you are still getting the BSOD, then you might have to Repair Windows Registry. Why? You may ask. Well, Each time you install or uninstall a software on your Computer, a registry key is added to windows. Ultimately Registry entries are disturbed every now and then and may get corrupt eventually. I will better not dare to Discuss how to manually edit the Registry because of the high Risk of messing things up. 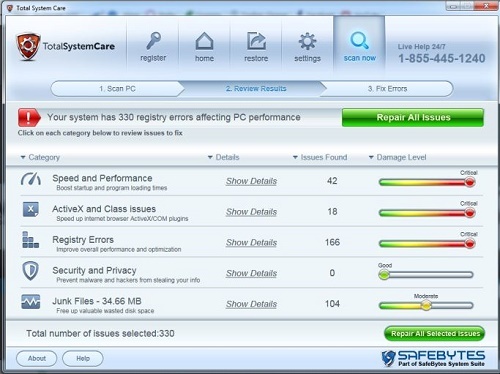 But, There are Softwares like Total System Care that may come to your Rescue. Total System Care will organize your Registry entries, Remove unwanted ones and Fix the Corrupt ones, Which may ultimately solve this BSOD Issue. Remember, Healthy and Organized Registry Entries are key to Healthy and Error Free PC. Not only Registry Entries but Total System Care will take care of other Corrupt System files too. One Can say the tool is Critical Process Died fixer tool. System File Checker is one Handy tool that Windows OS Provides, What it will do is Scan for Corrupt or faulty System files, and Restore or Fix them if found. First of all you, will have to Open Command Prompt as Admin. Press Windows + X or Right Click on Start Button to Click on Command Prompt (Admin). Now Type "sfc /scannow" and hit enter. This will take good 15-20 minutes to Complete so sit back tight. Once finished you will be able to see if any issue was found in system files and if found, were they solved or not. That is it, Now reboot your PC and you should not see BSOD with error Critical_Process_Died if Corrupt system files were really the reason. Method #4: Using Restore point. Restore Points proves to be very useful in situations like this. This Method is only useful for you if you already have a Restore point Created in the past when your PC was Running Smooth as Butter. If you don't know about restore points, then please skip this method, But Learn about Restore points later and Create one immediately after this Blue screen of death is Solved. For those who already have a Restore point created, You know what you have to do right? Correct, Do it and See if this Solves the Critical Process Died Issue. Method #5: Refresh or Reinstall Windows. If nothing works from the things mentioned above, then you might very well be forced to Refresh or Reinstall Windows. Refreshing Windows will keep your Personal data, but your base operating system will be reinstalled. Reinstalling Windows will Remove Everything from your System Drive, which in most case is C Drive. So you better take a backup of anything present in your C drive. This Option Pretty much guarantees to Solve Critical_Process_Died Error. To Refresh your PC, Simply Mouse hover on the right corner of your screen, Click on Settings > Change PC Settings > Update and Recovery > Recovery . Now Click Get Started just below "Refresh your PC without affecting your Files". To Reinstall Windows, Simply Insert your Windows OS DVD and get Started. Don't forget to Format your C drive before installing. Few More things You can Try. Update all Drivers Automatically with Driver Agent. Check for Virus or Malware or Spyware with Anti-Malware Pro 2017. Download all Windows Updates if Available. Check your Hard disk for error by Typing "Chkdsk /c" in Command Prompt. Check your Memory with Memtest86. I hope after this long read and hectic task you finally manage to get rid of Critical Process Died Windows 10 Blue Screen, if you have anything to say regarding the post, please Speak your mind in Comments below. i had used all this ideas still i m stuck with critical process died error. Hi, Please send a screenshot to fixerrsdotcom@gmail.com so that we can get a better idea about your actual issue. Please Backup all your data first. Once this is done, Try Method no. 5 which is to Refresh or Reinstall Windows. I am assuming you are using Windows 10. I can't get to where I refresh windows. Start > Settings > Update & Security > Recovery. You will Se Reset this PC option and under it Get Started. Please Perform this if and only if you are not able to Fix Critical Process Died BSOD with other Methods. Hello KAT, Can you answer Which Operating System you are currently On? What changes you recently made to your system like Upgrading/Changing RAM or HDD? Hi BASSTIAN, Safe Mode would work if there are drivers Conflicting on startup. Have you Tried other Methods? Scan your system files for error, check method 3. Hi BATOUL FOUANI, Did you made any recent hardware changes to your PC? Since when you are getting Critical_Process_died error? Do you have a Restore Point? if yes, then do a system restore. I get the critical process died error after trying to boot. Every time i try to boot the BIOS says its trying to repair drives. After it has finished this step it goes to the BSOD giving me the C P D error. I have tried everything the troubleshooting suggests; Safe mode doesn't work gives an error, cant restore/refresh/wipe gives error, Even CMD troubleshooting by scanning say authentication stage failed. I didnt make any changes to hardware before getting this error. Windows 10. Is the best solution to buy a new HDD? Will booting from a USB solve the issue? All those stuffs above sounds great but it's sad to say, none of them works. Refreshing says "There was a problem refreshing your pc. No changes were made" same as using the command prompt. And what is worse, I am battling with getting my way past bitlocker password crap. System restore too isn't working. You can't get past the stage where you'd select the drive. Shows a yellow flag that system protection something something. You can't boot into safe mode too. It still shows "Your pc ran into a problem. We're working our way to fix that bla bla bla, (Blue Screen Of Death number 2).. The easy way to get past BSOD is to brace yourself for the pain and get yourself a new hard drive.. It's a screen of DEATH.. What death holds, life's got no option in taking back. There's a 99% possibility you ain't gonna solve it. Hello, If you are not able to do even one method mentioned above then there is certainly something wrong with your PC/Laptop. We tried to mention all possible solutions to this BSOD which users can perform. You said replacing Hard drive and installing windows altogether helped you. Thank you for your suggestion this might help others but i would always try re-installing windows again. I am getting the BSOD shortly after loading a PhotoShop project. After my laptop restarts, it works fine. But it happens again when I open that PhotoShop project. I dunno if there is a problem with PhotoShop or something in my laptop. Hi Dustin, In your case Photoshop might be the cause. So, have you tried Reinstalling it? This is the first thing you must do. Let us know !!! I did the sfc /scannow option. It 100percent verification. Last line says ,"Windows Resource Protection could not perform requested operation. HELLO , thank u to help , i have this problem every time i install new update for windows sadly to say every time i have to install new windows i would to say that my battery has been out of date or in bad condition might that cause this problem ? "Hidden deep in the ToA is a cancellation fee of $8.95 that must be paid to get out of reoccurring charges"
"There are other programs out there that are on the up n' up. Do yourself a favor and pass this one up"
"These people are criminals, they will hijack your comp!" Antivirus software has deleted some system files and now its not starting. None of the method worked.